Old Money—Will the Steelers Be Able to Afford Antonio Brown? Dale Lolley just returned from vacation, and the first thing he wrote about was the new contract the Seahawks gave Doug Baldwin. The contract is for four years, $46 million, $24 million guaranteed. This now moves Antonio Brown, the (almost) undisputed best receiver in the NFL, into 18th place in the league in terms of wide receiver pay. There is no doubt there are guys on the list above Antonio making far more money for far less production. This raises two questions—1) when the time for contract renewal comes up, can the Steelers afford Antonio, and 2) should they try? Brown turns 28 in a week, and has two years left on the current deal, although the Steelers typically work a year ahead with players they know they want to keep. So if they negotiate a new deal next summer, Brown will be 29. What does this say about his value going forward? Despite finally reporting to the Steelers today, Wallace is still being taken too high with a FantasyPros.com average draft position (ADP) of WR14. Antonio Brown had 309 more receiving yards than Wallace over their last 11 games despite playing 183 fewer snaps. The only reason Wallace caught more touchdowns over that span is that he vultured a pass intended for Brown in week 9. Wallace may be the more physically gifted receiver, but Brown is the better fantasy option. There’s a fairly steady downhill slope for receivers in their late 20s and early 30s that isn’t nearly as dramatic as it is with running backs. The question not answered in the article is why. Is it strictly a matter of loss of speed? Is it loss of drive or determination or work ethic or interest? It seems to me it could be a number of things. A guy like Hines Ward who was never fast probably aged a good bit more gracefully than someone who relies strictly on speed would. Even a speedster can learn more tricks, of course. The reports out of Baltimore’s mini-camp are that Mike Wallace has become a much more sophisticated route-runner, and with a reliable quarterback throwing to him he could possibly put up way better numbers than he did in Minnesota. The slope for secondary and third receiver production drops evenly, but the elite scorers fight off age declination to a higher degree. The main pocket to strike in acquiring age that is paired with talent is 23-29 as that makes up 75 percent (405 of 540) of the top 12 scoring group. Your last shot at garnering close to peak return in value for a stud receiver is just before they turn 30 years old. This is likely the final offseason that Jordy Nelson and Calvin Johnson will carry their full trade value. Those players are still capable of squeezing out quality seasons down the road, but the window for max return is nearly closed at that age. 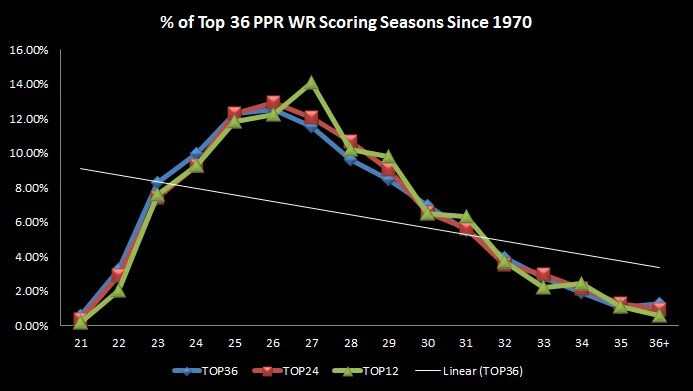 The light green bar, if you can’t read the legend, is showing a peak at age 27 for the top receivers and a decline thereafter. It also shows a somewhat sharper decline in production than the PFF chart above. The main point is that the decline is relatively slow, but definite. [T]here’s a fairly firm understanding that even the best NFL players see their production decline over time. The game is visceral and taxing physically…In 2014, 87.4 percent of all backs and pass catchers were under the age of 30. [A]ge is constantly getting squeezed downhill. Whether due to physical breakdown, performance, contractual obligations or all of the above, NFL skill positions are filled with youth regularly…There aren’t going to be a lot of strong producers that are old because they simply aren’t being rostered. That in itself has bearing. Looking at the data from outside of the fantasy aspects doesn’t yield any different conclusions. In a March 2015 article on numberfire, author Joseph Juan compiled a list of wide receivers since 2000 who have been selected to at least one Pro Bowl and whose careers span six or more seasons within the past 15 years. The 28 players who qualified are what he based his analysis on. 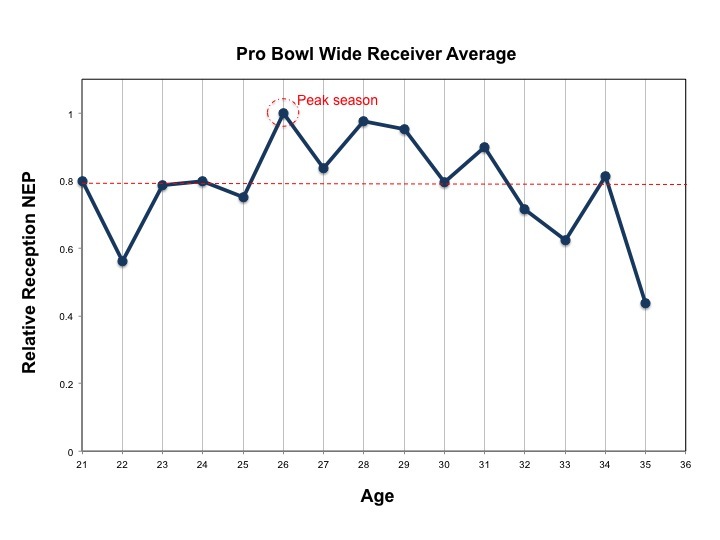 Here we see that, on average, our elite wideouts hit their peak around their 26th birthdays and maintain this level of production up until their 32nd birthday (again, approximately six seasons after hitting their prime), when they begin their steady decline from the top. The really interesting part is that he ran the data two ways—in terms of years in the league, regardless of age, and then what you see above. A receiver who declares as a junior may be almost two years younger than a guy who red-shirted his first year and was a fifth-year senior. The data correlated better to age than it did to years of experience. If I’m Antonio Brown, I’m going to be looking for a good number years and an even better amount of guaranteed money. If I’m the Steelers and looking at these figures, I’m going to want to guarantee as little money as possible, and possibly front-load it. Given that Brown will be 29 entering training camp next season, you have to ask yourself whether he has any years of peak production left. This season is going to be very telling, because according to the data shown he’s more or less at the end of the peak already. The determination on his part to try to top 2000 receiving yards this coming year has a lot of interesting implications. The question should also be asked—does Brown bring things to the Steelers other than just his production? I think most of us would say yes. The real question is, are those things sufficiently valuable to the Steelers to justify top money into his thirties? Assuming the Steelers and Brown were to negotiate a four-year contract similar to the one the Seahawks just gave Doug Baldwin, and assuming they tear up the previous contract, since the new contract would definitely have to be for more money than the $8.71 million he is scheduled to make in 2017, this means Brown would be 32 during the 2020 season, which would be the last year of the contract. In some ways it would argue they should negotiate the new contract this summer, but given the other people they have to negotiate with, I can’t see that happening. And even renegotiating next year produces a reasonable timeline. Although Brown would presumably not be as productive during that final contract season as he has been the past two years, he should still be a productive receiver. There is still the question as to whether the Steelers can (and should) pay Brown what it is going to take to keep him. In some ways, the most sensible thing might be to play out the current contract, possibly adding some sort of sweetener for the final two years since he’s so grossly underpaid, and hope the younger guys are prepared to take the reins. But if Ben Roethlisberger is still in peak form, and the window is therefore possibly open for another couple of Super Bowls, perhaps one swallows hard and pays Brown what it would take to keep him. Very interesting article Rebecca. I’ve long argued that the Steelers shouldn’t renegotiate with Brown, but rather fully guarantee his current contract. That doesn’t seem to be happening – so be it. Art Rooney II has a very interesting “Money Ball” decision coming up with Brown. As it turns out, three of the four of them peaked (in terms of catches) at age 26, although Hines Ward did see a bit of rebound in his early 30’s before suffering a sharp drop off. Per Joseph Juan’s argument, Brown should have peaked in 2014, yet he had a better year in 2015. As you say, this year will be interesting. Stallworth’s storied career had many outside events affect his productivity. There was the year Bradshaw was dumped on his head by Turkey Jones and Mike Kruczek took over at QB and threw as few as 6 passes in a game. There was the year injuries limited him to four games. There was the retirement of Lynn Swann, and the retirement of Bradshaw. Of course, at 6’2″, Stallworth was an entirely different type of receiver than the small and amazingly quick AB. AB is far more reliant on quickness and timing, and so an injury to – or retirement of – Ben would almost certainly affect Brown negatively. AB and Ben could both get out of sickbeds on Christmas Day and hit a third and six timing pattern for a first down. Hell, they could do it in their sleep. Stallworth, on the other hand, ran such great patterns and had such great hands and size that he could play banged up, lose a little quickness, and still be lethal. Not sure how lethal AB will be, if and when he loses that quickness. Thanks for the additional information. Really, I think all of it just goes to show you that John Stallworth was not only a Hall of Fame Talent, but a unique Hall of Fame talent. You make another point which hasn’t quite been touched on, and that’s the “Roethlisberger factor,” meaning, how closely is Brown’s tenure with the team tied to Ben’s, both in the eyes of management and the eyes of both players. Brown’s dedication to his craft, assuming injuries don’t catch up to him, should buy him an extra year or two but it does, as hombredeacero points out, become a moneyball situation. The other factor is Ben’s window of opportunity, which I believe will close quicker than most would like, can not be for that many more years. Depending on injuries, it could even end before the start of the 2017 season (miles vs years). I think the Steelers let Brown play out his contract and then see if they can afford him. AB has defied the odds, mostly through hard work and determination. I don’t know what the price will be, but I think wrapping him up for a few extra years is worth exploring.